The Pennsylvania Senate recognized the outstanding accomplishments of NEPIRC and its Industrial Resource Center Network partners in a formal resolution declaring March 13, 2013 as Pennsylvania Industrial Resource Center Day across the Commonwealth. The Pennsylvania Senate recognized the outstanding accomplishments of NEPIRC and its Industrial Resource Center Network partners in a formal resolution declaring March 13, 2013 as Pennsylvania Industrial Resource Center Day across the Commonwealth. State Resolution 54 was introduced after consideration of the 25 years that NEPIRC and its statewide affiliates have invested in providing regional manufacturers with services designed to enhance their competitiveness, strengthen their long-term viability, and accelerate their adoption of new technologies and innovations. During the most recently-completed Commonwealth fiscal year alone, the consultative services provided to manufacturers by the statewide network of Industrial Resource Centers are proven to have facilitated over $718 million in new or retained sales and over $90 million in bottom-line cost savings for their clients. During that year, the Industrial Resource Centers worked with 780 different manufacturers across the Commonwealth and, in so doing, created or preserved 4,955 manufacturing jobs, according to data provided by those companies. Pennsylvania Senator John Blake presented NEPIRC Executive Director, Eric Joseph Esoda, with a framed copy of the resolution at a Robotics Showcase event hosted by Keystone Automation, a machinery and robotics design and manufacturing firm located in Duryea, PA, and JAM Works LLC, an advanced manufacturing systems integrator and automated equipment manufacturer, also located in Duryea, PA. 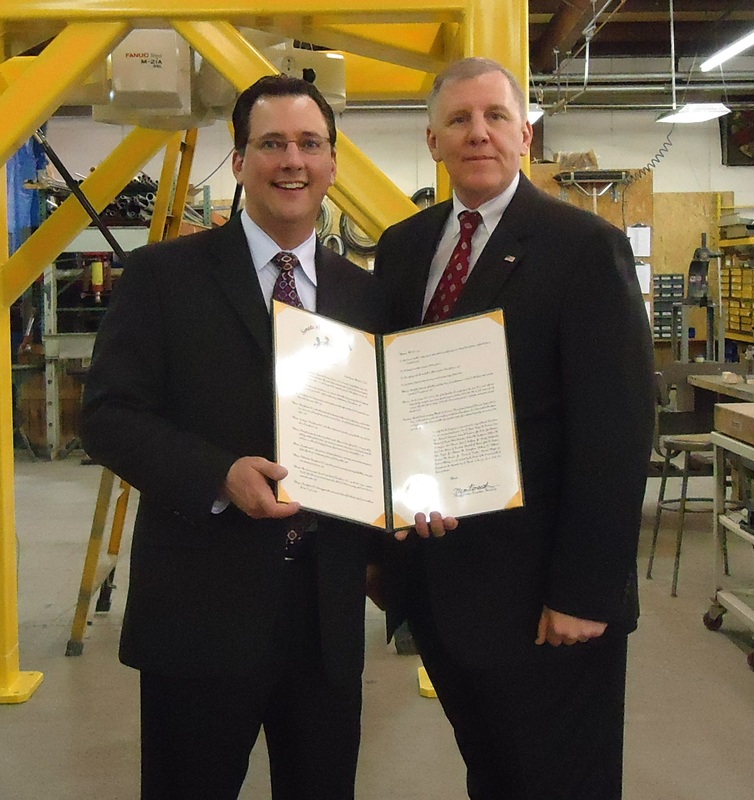 Senator John Blake presents NEPIRC Executive Director, Eric Joseph Esoda, with a copy of Senate Resolution 54 declaring March 13, 2012 as Pennsylvania Industrial Resource Center Day.